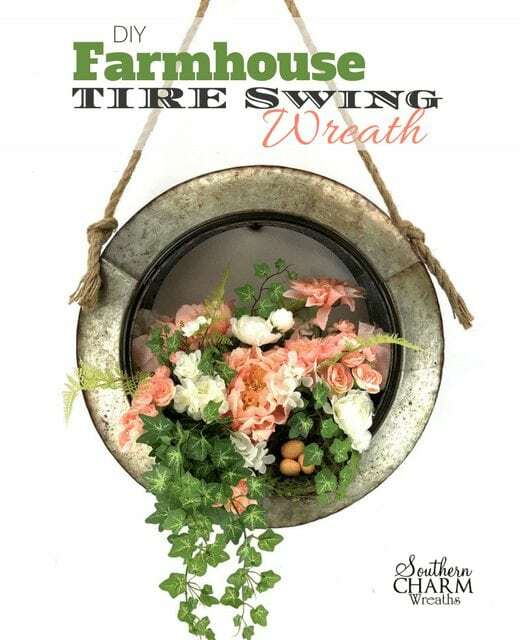 Today we’re trying out an idea I got from another blogger, The Craft Patch – a Farmhouse Tire Swing Spring Wreath. When lots of wreath makers find a viral video, they come to me for more detailed steps and instructions. So I’m excited for you to see my version of this creative wreath! This post contains some affiliate links for your convenience. Click here to read my full disclosure policy. Hot glue two blocks of Styrofoam to the inside bottom of the tire. Note: If the Styrofoam is too large, use a serrated knife to shape it and if it doesn’t seem to hold, you can use E6000 glue but it will need to dry overnight. To hide the Styrofoam, cover it with sheet moss using floral pins. If you are using flower bushes like I am in the video, separate them by carefully using a box cutter or knife to break the wax seal on the stem. This will give you nice long stems to work with. Begin inserting your flowers into the Styrofoam. Start by placing the taller flowers in the back. Trim the flower stems depending on how tall you want the flowers to appear. Note: You can use an awl to make a hole before inserting your items if you are having trouble getting the picks into the Styrofoam. I added birds nests to the arrangement as well. To do this, add a bit of hot glue to the bottom of the nest, then insert picks at an angle (like an X) and add a dab of hot glue to the picks before inserting into the arrangement. Next, add in the ivy. Separate it out if it is a part of a bush by cutting into individual stems. I like to mimic how an ivy plant would look and let it trail down the front of the wreath. Note: If the stems are too thin to go into the Styrofoam, you’ll want to add a pick and a bit of hot glue. Go back and fill in with the remainder of your flowers. There is no right or wrong, it’s all about what you like. I tend to group smaller flowers together for a bigger impact and try to vary the height. If your arrangement will be viewed from both sides, add items to the back to mirror the front. Lastly, I added a few fern pieces. This adds a nice bit of dimension and texture to the arrangement. I hope you enjoyed this Farmhouse Tire Spring Wreath tutorial and again thanks to The Craft Patch for her inspiration! You could use whatever colors or flowers you would like and add a bow of your choice as well. Wouldn’t this be fun with a 4th of July theme? Let me know if you enjoyed this and don’t forget to join me on Facebook Live, Thursdays 7:30PM EST. 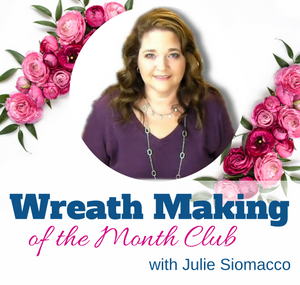 Hi Julie…It really amazes me the things people don’t use for wreaths. I can remember back in the day some things that were popular then they phased out and now they are back again. I am going to be 63 in August so that is how I have seen many things come and go. This tutorial was very interesting but I looked for one of these tire things about a week ago as a gal made one in my wreath group…none to be found at the store or online. I had to have someone look for me at the store as I am not able to get out any longer. I don’t worry about the small things though….Thank you for doing the videos..I enjoy each one you do and you are easy to understand and I enjoy them very much. I am not sure if I am a member to receive the tuts that come out or not…I loved the new rooster wreath, but if they cost money I am on limited income due to SSDI, so I might not have been able to sign up…but I wanted to thank you for the ones I am able to see and learn from. I surely wish I could get a small business going and earn some extra income in my home, but doesn’t look like I will. You have a blessed Easter ok? Thank you again!